дома » ARMENIAN - ENGLISH CONVERSATION GUIDE հայերեն անգլերեն զրուցարան » ՀԱՅԵՐԵՆ — ԱՆԳԼԵՐԵՆ ԶՐՈՒՑԱՐԱՆ: ԵՐՐՈՐԴ ՄԱՍ: ԲԱՆԱԿՑՈՒԹՅՈՒՆՆԵՐ TALKS. Ներբեռնել լավ որակով ( PDF) ԲԱՆԱԿՑՈՒԹՅՈՒՆՆԵՐ TALKS թո:քս: ( էջ 119-138). վերաբերյալ: Unfortunately, contracts aresometimes infringed.Were the talks bilateral ormultilateral?The talks were held ina business-like spirit. the alternations to the contract. goods delayed over 10 weeks. անել անհնարինը in general, generally, altogether,on the wholein the first instance, first of allfor all that, still, nevertheless, allthe same, howevermake a casual mention of smth. facilitate the execution of smth. smb. ; have dealings with smb. է պատվերի մասնակի կատարմանը: We are all concerned about theprogress of the order.Your order is valid for a month.It’s our trial order.What point shall we discuss now?I suggest discussing the order. place your future orders with us. Previous post: ՀԱՅԵՐԵՆ — ԱՆԳԼԵՐԵՆ ԶՐՈՒՑԱՐԱՆ: ԵՐՐՈՐԴ ՄԱՍ: ԳՈՐԾՈՒՂՈՒՄ: A BUSINESS TRIP. 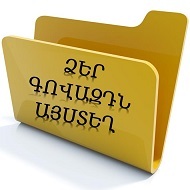 Next post: ՀԱՅԵՐԵՆ — ԱՆԳԼԵՐԵՆ ԶՐՈՒՑԱՐԱՆ: ԵՐՐՈՐԴ ՄԱՍ: ԱՊՐԱՆՔՆ ՈՒ ՆՐԱ ՈՐԱԿԸ: GOODS AND THEIR QUALITY.